Catastrophe: Which Ancient Disaster was the One to Destroy Atlantis? Atlantis Online > Forum > Atlantis > the Scientific Atlantis > Catastrophe: Which Ancient Disaster was the One to Destroy Atlantis? Re: Catastrophe: Which Ancient Disaster was the One to Destroy Atlantis? In the year 2000 my book GATEWAY TO ATLANTIS was published for the first time. It proposed that Plato’s concept of Atlantis was based on stories reaching the Mediterranean in Plato’s age of an immense cataclysm that rocked the Bahamas and Caribbean at the end of the Pleistocene epoch, causing fire to rain from the sky, unimaginable tsunamis and the drowning of low lying regions. Cuba was singled out as matching very well the description of Atlantis’s central island, while the Bahamas was almost certainly the sunken lands where according to Plato no ocean going vessel could pass any more since it was now too shallow (which the Bahamas unquestionably is, following the rise of the oceans at the end of the last Ice Age). The cataclysm I proposed that caused the destruction of Atlantis is identical to that being cited by the 25 strong scientific team at the American Geophysical Union last week. 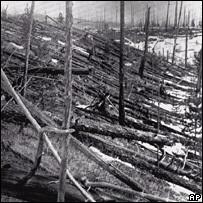 Using available evidence on the structure and dating of the Carolina Bays, a knowledge of the firestorms recorded in sentiments across the United States, as well as details of the flow of ice melt waters and the mass extinction of Pleistocene animals, I concluded that a comet had come out of the north-western skies and disintegrated into pieces, causing multiple aerial detonations across North America. This resulted in wide scale firestorms, massive explosions, tens of thousands of elliptical craters from the Yukon down to Florida, as well as the onset of the Younger Dryas, or mini ice age. This in turn led eventually to the end of the last Ice Age, with the drowning eventually of large areas of the Bahamas and Caribbean. This much is now being proved correct, but if this is the case then scientists should also look at what I said happened as a result of this comet impact. German rocket scientist Otto Muck in his book THE SECRET OF ATLANTIS (1978, 1st UK edition) was the first to point out the existence of massive elliptical craters in the West Atlantic Basin, off the coast of Florida. He proposed that these were the result of an asteroid strike, which caused tremendous underwater earthquakes, ripping apart the tectonic plates that join to form the Great Atlantic Rift and pulling beneath the earth a whole continent that sat astride the ridge. This, of course, Muck concluded was the lost continent of Atlantis. No evidence of this former island continent has ever come to light, even though the Mid Atlantic has been the chosen site of Atlantis ever since the theory was first proposed by granddaddy of Atlantology, Ignatius Donnelly back in 1882. Curiously, Donnelly was one of the first to take seriously the theory of a major cataclysm hitting the North American continent and causing mass devastation at the end of the Pleistocene epoch. It appeared in his book RAGNORAK: THE AGE OF FIRE AND GRAVEL (1883). Using Muck’s lead, I proposed in GATEWAY TO ATLANTIS that the apparent gigantic craters in the West Atlantic Basin were perhaps evidence of the largest parts of the aforementioned comet overshooting North America and crashing into the ocean. If so, then this would have produced massive underwater earthquakes and unimaginable tsunamis, which would have devastated the Bahamas and Caribbean to the south. I found evidence also for the presence on the Caribbean islands prior to this time of Pleistocene animals such as the giant sloth, as well as the existence of species of snake on different islands that can only have thrived when the islands were linked together. In addition to this, myths and legends preserved by the former inhabitants of the Caribbean, as well as their descendents in South and Central America, spoke of a time when all the islands were joined. Then came a fire out of the sky, which was followed by massive flooding, which hit the islands twice. Afro-Caribbean islanders on Tobago even spoke of a time when the islands split after the ‘old moon broke’ and came crashing into the sea, presumably having learnt such stories from the indigenous peoples there beforehand. All of the myths and legends, which derive from Bahamas in the north to the Lesser Antilles in the south, could be accounted for if it was shown that the larger fragments of the comet which had fragmented over North America at the end of the Pleistocene epoch ended up in the Western Atlantic Basin. If so, then there was every chance that almost all of the indigenous populations of the islands would have been wiped out, with only a few survivors left to tell the tale. Such stories were then retold across millennia, both in the islands and also by their descendents on the mainland, until finally they were conveyed to incoming Mediterranean traders either prior to or during the life of Plato, in the same way that similar stories were told to the first mariners to reach these same isles in the wake of Columbus. These ‘voyagers’, the term used by Plato in his dialogue entitled the ‘Timaeus’, and later in the ‘Critias’, were most probably either Phoenicians out of Southern Spain or Carthaginians out of North Africa. The crews of these ocean-going vessels would also have had contact with Mediterranean ports such as those on Sicily, in Carthaginian hands during Plato’s life. Having spent time there himself, he might easily have come across these rumours and stories of a once great island empire across the ‘Atlantic Sea’ devastated by earthquakes and floods, deciding to use them in his dialogues. One clue is the use of Semitic names in his Atlantis account, showing that his primary maritime sources came not from Egypt, as is always assumed due to the dialogues’ use of Solon as the collector of these tales from the old priest of Sais, but from either Phoenician or Carthaginian sources, who spoke forms of the Semitic language. Plato’s suggestion that the cataclysm that devastated Atlantis either took place in 8500 BC (found in the ‘Timaeus’) or 9500 BC (found in the ‘Critias’), is very close to the proposed dates for the end of the Pleistocene epoch. However, I suspect that these were the only real clues he got from Egypt, for they are very close to the time-frames given in temple chronologies for the age of the gods in ancient Egyptian tradition. Thus their connection with the destruction of Atlantis is merely a happy coincidence, although one that is now proving to be bizarrely accurate. In my opinion, there is compelling evidence that Bahamas and Caribbean once supported a high culture with maritime capabilities prior to the cataclysm which devastated their island civilization. More and more examples of vast underwater features of human construction are coming to light off key Bahaman islands such as Bimini and Andros through the scientific work of Greg and Lora Little, and if it can be established that these predate what I call the Carolina Bays event, then this formed an important missing piece of the puzzle in our understanding of this cataclysm and its effects on the development of the Atlantic myth. I sincerely hope that people will re-examine the proposals in GATEWAY TO ATLANTIS, for they are now being authenticated by excisting new scientific findings. "Their impact theory shouldn't be dismissed; it deserves further investigation." The blast would not only have generated enormous amounts of heat that could have given rise to wildfires, but also brought about a period of climate cooling that lasted 1,000 years - an event known as the Younger Dryas. The scientists point out that archaeological evidence shows that early Stone Age cultures clearly suffered serious setbacks at this time. In particular, American Stone Age hunters, descendants of the hunter-gatherers who had migrated to the continent from Asia, vanished around this time. These people were some of the fiercest hunters on Earth, men and women who made magnificent stone spearheads which they used to hunt animals including the mammoth. Their disappearance at this time has been a cause of intense debate, with climate change being put forward as a key explanation. Now there is a new idea: the first Americans were killed by a comet. It was not just America that bore the brunt of the comet crash. At this time, the Earth was emerging from the last Ice Age. The climate was slowly warming, though extensive ice fields still covered higher latitudes. The disintegrating comet would have plunged into these ice sheets, causing widespread melting. These waters would have poured into the Atlantic, disrupting its currents, including the Gulf stream. The long-term effect was a 1,000-year cold spell that hit Europe and Asia. 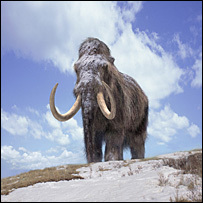 These are the sudden disappearance of the first Stone Age people of America, the disappearance of mammoths throughout much of Europe and America and the sudden cooling of the planet, an event known as the Younger-Dryas period. Various theories have been put forward to explain these occurrences, but now scientists believe they have found a common cause in a comet crash. However, the idea is still controversial and the theory is bedevilled by problems in obtaining accurate dates for the different events. Newswise — Two University of Oregon researchers are on a multi-institutional 26-member team proposing a startling new theory: that an extraterrestrial impact, possibly a comet, set off a 1,000-year-long cold spell and wiped out or fragmented the prehistoric Clovis culture and a variety of animal genera across North America almost 13,000 years ago. Driving the theory is a carbon-rich layer of soil that has been found, but not definitively explained, at some 50 Clovis-age sites in North America that date to the onset of a cooling period known as the Younger Dryas Event. The sites include several on the Channel Islands off California where UO archaeologists Douglas J. Kennett and Jon M. Erlandson have conducted research. The theory is being discussed publicly, for the first time, Wednesday, May 23, at the 2007 Joint Assembly of the American Geophysical Union in Acapulco, Mexico. Kennett is among the attendees who will be available to discuss the theory with their peers. The British journal Nature first addressed the theory in a news-section story in its May 18 issue. Before today, members of the team – including Kennett’s father, James P. Kennett of the University of California, Santa Barbara, and Richard B. Firestone of Lawrence Berkeley National Laboratory – had been quietly introducing the theory to their professional colleagues. The researchers propose that a known reversal in the world’s ocean currents and associated rapid global cooling, which some scientists blame for the extinction of multiple species of animals and the end of the Clovis Period, was itself the result of a bigger event. While generally accepted theory says glacial melting from the North American interior caused the shift in currents, the new proposal points to a large extraterrestrial object exploding above or even into the Laurentide Ice Sheet north of the Great Lakes. The K-T layer marks the end of the Cretaceous Period and the beginning of the Tertiary Period, when numerous species were wiped out after a massive asteroid is believed to have struck Mexico’s Yucatan Peninsula and the Gulf of Mexico. “This was a massive continental scale, if not global, event,” Kennett said. He and Erlandson say that they are currently evaluating the existing Paleo-Indian archaeological datasets, which Kennett describes as “suggestive of significant population reduction and fragmentation, but additional work is necessary to test this hypothesis further.” Earlier research efforts need to be re-evaluated using new technologies that can narrow radiocarbon date ranges, and, as funding becomes available, new sites can be located and studied, Erlandson said. IT'S IN THERE. A layer of carbon-rich sediment (arrow) found here at Murray Springs, Ariz., and elsewhere across North America, provides evidence that an extraterrestrial object blew up over Canada 12,900 years ago. The hallmarks include lumps of glasslike carbon (top), carbon spherules (middle, in cross section), and magnetic grains rich in iridium (bottom). 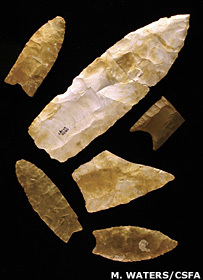 At sites stretching from California to the Carolinas and as far north as Alberta and Saskatchewan—many of which were home to prehistoric people of the Clovis culture—researchers have long noted an enigmatic layer of carbon-rich sediment that was laid down nearly 13 millennia ago. "Clovis artifacts are never found above this black mat," says Allen West, a geophysicist with Geoscience Consulting in Dewey, Ariz. The layer, typically a few millimeters thick, lies between older, underlying strata that are chock-full of mammoth bones and younger, fossilfree sediments immediately above, he notes. The long axes of the great majority of the Carolina Bays point toward locations near the Great Lakes and in Canada—a hint that the extraterrestrial object disintegrated over those locales, says Howard. The main site -- there is at least one other in roughly the same area and a third is suspected -- is about three miles below the surface of the Atlantic and located about 2,000 nautical miles southwest of the Canaries. But that apparently did not happen this time. Where there should be a four-mile-thick layer of crust, there is instead that much mantle -- the very dense, dark green rock that makes up the deep inner layer of the Earth. © 2007 Associated Press/AP Online. All rights reserved. © 2007 Sci-Tech Today. All rights reserved. On close inspection, the chevron deposits contain deep ocean microfossils that are fused with a medley of metals typically formed by cosmic impacts. And all of them point in the same direction - toward the middle of the Indian Ocean where a newly discovered crater, 18 miles in diameter, lies 12,500 feet below the surface. Scientists in the working group say the evidence for such impacts during the last 10,000 years, known as the Holocene epoch, is strong enough to overturn current estimates of how often the Earth suffers a violent impact on the order of a 10-megaton explosion. Instead of once in 500,000 to one million years, as astronomers now calculate, catastrophic impacts could happen every few thousand years. So far, astronomers are skeptical but are willing to look at the evidence, said David Morrison, a leading authority on asteroids and comets at the NASA Ames Research Center in Mountain View, Calif. Surveys show that as many as 185 large asteroids or comets hit the Earth in the far distant past, although most of the craters are on land. No one has spent much time looking for craters in the deep ocean, Morrison said, assuming young ones don't exist and that old ones would be filled with sediment. Astronomers monitor every small space object with an orbit close to the Earth. "We know what's out there, when they return, how close they come," Morrison said. Given their observations, "there is no reason to think we have had major hits in the last 10,000 years," he continued, adding, "But if Dallas is right and they find 10 such events, we'll have a real contradiction on our hands." Peter Bobrowski, a senior research scientist in natural hazards at the Geological Survey of Canada, said "chevrons are fantastic features" but do not prove that megatsunamis are real. There are other interpretations for how chevrons are formed, including erosion and glaciation. Bobrowski said. It is up to the working group to prove its claims, he said. William Ryan, a marine geologist at the Lamont Observatory, compared Abbott's work to that of other pioneering scientists who had to change the way their colleagues thought about a subject. "Many of us think Dallas is really onto something," Ryan said. "She is building a story just like Walter Alvarez did." Alvarez, a professor of earth and planetary sciences at the University of California, Berkeley, spent a decade convincing skeptics that a giant asteroid wiped out the dinosaurs 65 million years ago. Deposits from mega-tsunamis contain unusual rocks with marine oyster shells, which cannot be explained by wind erosion, storm waves, volcanoes or other natural processes, Bryant said. "We're not talking about any tsunami you're ever seen," Bryant said. "Aceh was a dimple. No tsunami in the modern world could have made these features. End-of-the-world movies do not capture the size of these waves. Submarine landslides can cause major tsunamis, but they are localized. These are deposited along whole coastlines." For example, Bryant identified two chevrons found over four miles inland near Carpentaria in north central Australia. Both point north. When Abbott visited a year ago, he asked her to find the craters. To locate craters, Abbott uses sea surface altimetry data. Satellites scan the ocean surface and log the exact height of it. Underwater mountain ranges, trenches and holes in the ground disturb the Earth's gravitational field, causing sea surface heights to vary by fractions of an inch. Within 24 hours of searching the shallow water north of the two chevrons, Abbott found two craters. Not all depressions in the ocean are impact craters, Abbott said. They can be sink holes, faults or remnant volcanoes. A check is needed. So she obtained samples from deep sea sediment cores taken in the area by the Australian Geological Survey. The cores contain melted rocks and magnetic spheres with fractures and textures characteristic of a cosmic impact. "The rock was pulverized, like it was hit with a hammer," Abbott said. "We found diatoms fused to tektites," a glassy substance formed by meteors. The molten glass and shattered rocks could not be produced by anything other than an impact, she said. "We think these two craters are 1,200 years old," Abbott said. The chevrons are well preserved and date to about the same time. Abbott and her colleagues have located chevrons in the Caribbean, Scotland, Vietnam and North Korea, and several in the North Sea. Heather Hill State Park on Long Island has a chevron whose front edge points to a crater in Long Island Sound, Abbott said. There is another, very faint chevron in Connecticut, and it points in a different direction. But Madagascar provides the smoking gun for geologically recent impacts. In August, Abbott, Bryant and Slava Gusiakov, from the Novosibirsk Tsunami Laboratory in Russia, visited the four huge chevrons to scoop up samples. When a chondritic meteor, the most common kind, vaporizes upon impact in the ocean, those three metals are formed in the same relative proportions as seen in the microfossils, Abbott said. Breger said the microfossils appear to have melded with the condensing metals as both were lofted up out of the sea and carried long distances. About 900 miles southeast from the Madagascar chevrons, in deep ocean, is Burckle crater, which Abbott discovered last year. Although its sediments have not been directly sampled, cores from the area contain high levels of nickel and magnetic components associated with impact ejecta. Burckle crater has not been dated, but Abbott estimates that it is 4,500 to 5,000 years old. It would be a great help to the cause if the National Science Foundation sent a ship equipped with modern acoustic equipment to take a closer look at Burckle, Ryan said. 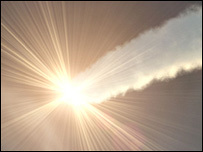 "If it had clear impact features, the nonbelievers would believe," he said. Masse analyzed 175 flood myths from around the world, and tried to relate them to known and accurately dated natural events like solar eclipses and volcanic eruptions. Among other evidence, he said, 14 flood myths specifically mention a full solar eclipse, which could have been the one that occurred in May 2807 B.C. Half the myths talk of a torrential downpour, Masse said. A third talk of a tsunami. Worldwide they describe hurricane force winds and darkness during the storm. All of these could come from a mega-tsunami. Of course, extraordinary claims require extraordinary proof, Masse said, "and we're not there yet." 1055 bc, 855 bc, 705 bc. Not ancient but future earthquake in Revelation 16:18, a GLOBAL earthquake. The three Floods belong to the story line of Athens. I don't think Atlantis was destroyed at all. I think the memory of Atlantis was destroyed by the failure of Ancient Language that we call "The Tower of Babel".